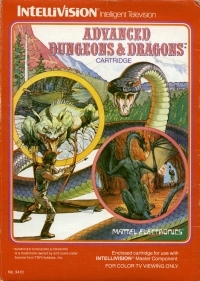 Box Text: ADVANCED DUNGEONS & DRAGONS Cartridge. the legendary Cloudy Mountain. Here you'll find the Crown of Kings… and the deadliest terror of all, the Winged Dragons. Plot your route to Cloudy Mountain. Fight your way through mountain caves. -1 or more can play. Four skill levels. -Obstacles include brown and black mountains, rivers, forests and walls. Monsters include dragons, demons, snakes, bats, rats, spiders… and the Winged Dragons. Each type of monster has different characteristics for you to discover. -Tools to overcome obstacles and arrows to slay monsters must be found in the caves. You start with 3 arrows. -Cave rooms and passages light up as you enter them. Who knows what evil lurks in the next room? -Exciting sound effects highlight game play. 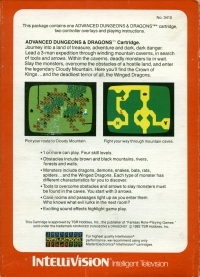 01-20-2016 aliensstudios Box Text ADVANCED DUNGEONS & DRAGONS Cartridge. Journey into a land of treasure. adventure and dark,dark danger. Lead a 3-man expedition through winding mountain caverns, in search of tools and arrows. Within the caverns, deadly monsters lie in wait. Slay the monsters, overcome the obstacles of a hostile land, and enter the legendary Cloudy Mountain. Here you'll find the Crown of Kings… and the deadliest terror of all, the Winged Dragons. Plot your route to Cloudy Mountain. Fight your way through mountain caves. -1 or more can play. Four skill levels. -Obstacles include brown and black mountains, rivers, forests and walls. Monsters include dragons, demons, snakes, bats, rats, spiders… and the Winged Dragons. Each type of monster has different characteristics for you to discover. -Tools to overcome obstacles and arrows to slay monsters must be found in the caves. 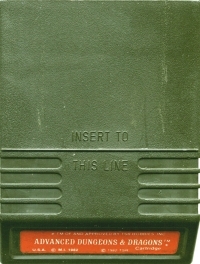 You start with 3 arrows. -Cave rooms and passages light up as you enter them. Who knows what evil lurks in the next room? -Exciting sound effects highlight game play. This is a list of VGCollect users who have Advanced Dungeons & Dragons (red label) in their Collection. This is a list of VGCollect users who have Advanced Dungeons & Dragons (red label) in their Sell List. This is a list of VGCollect users who have Advanced Dungeons & Dragons (red label) in their Wish List.